FARMHOUSE ISLAND PENDANT CHANDELIER: Simple wood and metal chandelier, especially designed to illuminate the heart of your kitchen, dining room or industrial styled places. Openwork wood and metal frame adds rustic vintage flair to your space, it boasts rustic-finished wood construction, designed to cast a soft ambient light over your room. CUSTOMIZED & ADJUSTABLE HEIGHT: Being equipped with 2 10" rods, 2 * 20" rods, this chandelier can be adjusted as 24.8"/ 34.8"/ 44.8"/ 54.8"/ 64.8" and 74.8" without using any additional tools or parts. IDEAL DIMENSION FOR VARIOUS CEILINGS: Rectangle Canopy: 10.6" * 4.7" * 1"/ Adjustable Rods: 60" (Including 2 * 10" rods, 2 * 20" rods, and 2 * 30" rods) / Wood and Metal Frame: 31.5" * 13.8". 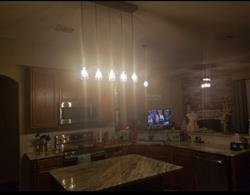 This kitchen island lighting is compatible with all ceiling types including flat, sloped, and slanted ceilings. FARMHOUSE GLASS PENDANT LIGHT FOR DINING ROOM: Simple linear island pendant lighting, especially designed to illuminate the heart of your kitchen, dining room or farm styled places. Crafted of metal in painting deep gray and rustic faux wood finish, this design features 4 clear Mason jars dropping down from the wood look linear base. FREE SIMPLE INSTALLATION: The kitchen island pendant package includes all the necessary assembling and installation parts along with clearly marked cords. Having a previous experience and some electrical knowledge should be enough to qualify you for doing the installation by yourself instead of hiring an electrician and spending more money. CUSTOMIZED & ADJUSTABLE HEIGHT: Being equipped with 2 * 59" chains, this farmhouse light can be adjusted from 26.5"to 85.5" without using any additional tools or parts. IDEAL DIMENSION FOR VARIOUS CEILINGS: Rectangle Canopy: 11" * 4.7" 1"/ Adjustable Chains: 59"/ Metal Frame: 30" * 25.5"/ Per Mason Jar Shade: φ3.9" * 6.7". This rustic chandelier is compatible with all ceiling types including flat, sloped and slanted ceilings. FULLY DIMMABLE & REQUIRES BULBS: This hanging pendant light works with compatible dimmer switch (Not Included) and requires 4 x E26 Base max 40W Bulbs (Not Included). FARMHOUSE PENDANT LIGHTING FOR KITCHEN ISLAND: Simple linear chandelier, especially designed to illuminate the heart of your kitchen, dining room or farm styled places. Crafted of metal in painting deep gray and rustic faux wood finish, this design features 3 clear Mason jars dropping down from the wood look linear base. FREE SIMPLE INSTALLATION: The barn lighting package includes all the necessary assembling and installation parts along with clearly marked cords. Having a previous experience and some electrical knowledge should be enough to qualify you for doing the installation by yourself instead of hiring an electrician and spending more money. CUSTOMIZED & ADJUSTABLE HEIGHT: Being equipped with 1 * 59" chain, this rustic pendant light can be adjusted from 26.5"to 85.5" without using any additional tools or parts. IDEAL DIMENSION FOR VARIOUS CEILINGS: Round Canopy: 5.1" * 1"/ Adjustable Chain: 59"/ Metal Frame: 22" * 25.5"/ Per Mason Jar Shade: φ3.9" * 6.7". This kitchen pendant lighting is compatible with all ceiling types including flat, sloped, slanted and vaulted ceilings. FULLY DIMMABLE & REQUIRES BULBS: This dining room hanging lighting fixture works with compatible dimmer switch (Not Included) and requires 3 x E26 Base max 40W Bulbs (Not Included). I absolutely love these lights. 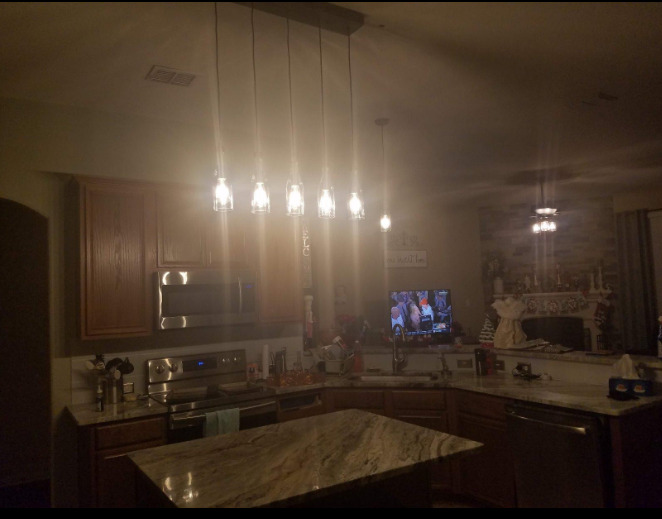 It pairs beautifully with the 5 light chandelier pictured (LNC A02982 Wood Pendant 5 Ceiling Linear Chandelier Kitchen Island Light fixtures, Brown), They were packaged very well. The cord lengths are adjustable, and there were no issues with installation. I plan on getting another of the single light to put in our corner nook to match. LOVE!! Highly Recommend!